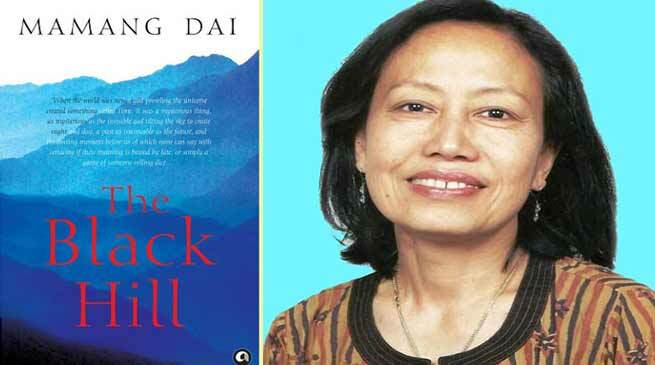 Noted poet-author from Arunachal Pradesh, Mamang Dai has been chosen for the prestigious Sahitya Akademi Award-2017 for her novel ‘The Black Hill’ in English language. On Thursday (Dec 21), the Sahitya Akademi announced its annual Sahitya Akademi Awards 2017 in 24 languages. Seven novels, five collections each of poetry and short stories, five works of literary criticism, a play and a book of essays have won the awards. Her first collection of poetry, River Poems, introduced by Keki Daruwalla established her as a major voice in Indian English literature, particularly literature of NE India. She has eight books, namely Arunachal Pradesh: The Hidden Lan; Legends of Pensam; Once Upon a Moontime: From the Magical Story World of Arunachal Pradesh; The Sky Queen; Stupid Cupid; Mountain Harvest: The Food of Arunachal Pradesh; River Poems and The Balm of Time, retranslated into Spanish El bálsamo del tiempo had turned her a globetrotting author. She was conferred Verrier Elwin Award by vernment of Arunachal Pradesh Govt in 2003 and Padma Shri by Govt of India on 25.01.11 in recognition of her immense contributions in the field of literature and education. Dai is the second Arunachalee to win the award after Thongchi, who won the Sahitya Akademi Award in 2005.The award includes a casket containing an engraved copper plaque, a shawl, and a cheque of Rs 1 lakh. The winners will receive the award on 12 February, 2018. Meanwhile, overjoyed with the honour won by Dai to add a jewel to literary cap of Arunachal Pradesh, members of Arunachal Pradesh Literary Society (APLS) led by its president Yeshe Dorjee Thongchi congratulated her for winning laurels for the State.